I hope everyone had an awesome Cinco de Mayo (and a not too awful seis de mayo!) I spent the day at Chevy’s where I indulged in fajitas and margaritas. After dinner drinks consisted of José Cuervo and coronas! I think I may have Mexican descendents because these types of food and drink are certainly some of my favorites haha. I got to spend Saturday with W, which was nice. We were planning on going to the inner harbor but when that plan failed we just had a lazy day swinging in the hammock. Well it was lazy, until he stole my phone and I chased him all over the house trying to recover it so he wouldn’t post something embarrassing as my facebook status. To end our day we scrolled through his selection of movies and I narrowed it down to The Omen and 300. Since I had never seen 300 and it’s about as manly a movie as you can get, we settled in to watch. I had some basic background information about the film, and interestingly enough it is one of my close girlfriend’s favorite films. What I discovered was a lot of tanned, oiled, muscular men in….diapers. Haha I couldn’t get over that and even asked W if they went to the bathroom in those things. I didn’t mind the film though. The odd looking creatures, massive fights scenes, and attractive men kept W from falling asleep and me from losing interest. However, as I have seen a history channel film on the historical background behind the Battle of Thermopylae, I knew that there were some major deviations from the film and the real thing. Apparently King Leonidas died like the third day and there were more than 300 warriors though their numbers were incredibly less than the Persian army. 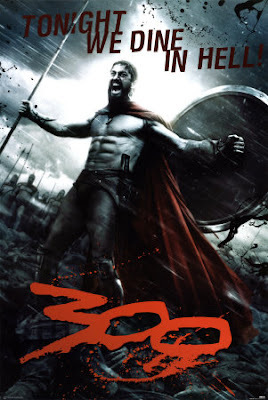 This comedian Doug Benson has a pretty good joke that basically goes ‘If you take 300 and subtract the number of good movies starring Gerard Butler since 300, you get 300.’ I like that. Also, yeah, pretty good macho movie that can keep everyone interested. I remember having a day off of high school the day that this came out so basically every male in my grade ended up seeing it at some point that day. Bizarre memory now, but it was cool at the time. I haven’t seen this. I’ve heard it’s a useful source of badass quotes despite its rotten excuse for historicity. In my own experience, that’s translated into zombie team rallying cries.